Thanjai dental -Dental Tourism in thanjavur,dental specialist,dentist in tamilnadu,best dentist in tamilnadu,thanjai dental in tamilnadu,oral care in thanjavur,oral care in tamilnadu,Cosmetic Dentistry,Laser Dentistry,Orthodontics,Smile Designing,Dental Tourism in Thanjavur,oral cancer,oral treatment in tamilnadu. "Doctor on Call 24/7 For Dental Emergency"
This field of dentistry deals with any pathology related to the oral and maxillofacial region. Here utmost care is taken to identify any precancerous or malignant lesions. The temporomandibular joint (TMJ) is a small joint located in front of the ear where the skull and lower jaw meet. It permits the lower jaw to move and function. The TMJ is the most constantly used joint in the body. Temporomandibular Joint (TMJ) disorders are not uncommon. Individuals with a TMJ disorder may experience a variety of symptoms, such as earaches, headaches and limited ability to open their mouth. When symptoms of TMJ trouble appear, consult us, Dr.Rajmohan being specialist in the areas of the mouth, teeth and jaws, is in a good position to correctly diagnose the problem. Diagnosing TMJ disorders can be complex and may require different diagnostic procedures. Special imaging studies of the joints may be ordered and appropriate referral to other dental or medical specialists or a physical therapist may be made. Treatment may range from conservative dental and medical care to complex surgery. Depending on the diagnosis, treatment may include short-term non-steroidal anti-inflammatory drugs for pain and muscle relaxation, bite plate or splint therapy, and even stress management counseling. If non-surgical treatment is unsuccessful or if there is clear joint damage, surgery may be indicated. Surgery can involve either arthroscopy (the method identical to the orthopaedic procedures used to inspect and treat larger joints such as the knee) or repair of damaged tissue by a direct surgical approach. Once TMJ disorders are correctly diagnosed, Dr.Rajmohan can provide appropriate treatment to relieve the problem. performed by a root canal specialist. It is designed to help keep a tooth that might otherwise require extraction. Often this procedure is performed when root canal treatment has already been carried out, but there is still some sign of infection associated with the tooth. The tooth above has previously had root canal treatment, but inflamed tissue remains at the root tip. 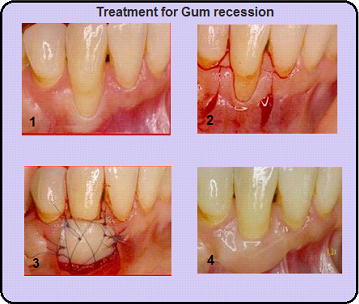 This procedure involves lifting up the gum over the top of the infection and gently removing the infected tissue. The infected tip of the root is then removed and a filling is placed into the root tip. A number of stitches, or sutures are then placed to hold the gum back in place and allow healing. The gum tissue is lifted and the inflamed tissue is gently removed. The gum tissue is then sutured back into position. A gum biopsy is a medical procedure in which a tissue sample is extracted from your gums for laboratory analysis. The test is used to diagnose causes of abnormal tissue in your gums, which might be a result of oral cancer or noncancerous mouth sores. Your gums also are known as gingiva. The gingival tissue is the tissue that immediately surrounds and supports your teeth. A gum biopsy is also called a gingival biopsy. Dr Rajmohan may choose from several different procedures to perform your gum biopsy. An incisional gum biopsy is the most common method of gum biopsy. In this procedure, he will remove a piece of the suspicious tissue and another of the nearby healthy tissue. By comparing the two samples, he can determine if a cancerous area is forming from the cells on that gum tissue, if the cancer cells come from another deeper growth, or if they have spread to the gum from a different site elsewhere in your body. During an excisional gum biopsy, he may remove the entire growth—depending on the size and location of the lesion, or sore. This type of biopsy is normally used to take out a small lesion that is in an easily reachable area of your mouth. He will remove the lesion, along with some of the nearby healthy tissue. This provides a sample for diagnosis, and helps prevent the lesion from spreading or growing. There are two different types of percutaneous biopsies—or procedures where a doctor inserts a biopsy needle through your skin. A fine needle biopsy may be used if the abnormal area is large. In this procedure, a small needle connected to a syringe extracts cells from the lesion. He may collect cells from different points on one lesion at the same time. A core needle biopsy, or punch biopsy, uses a small circular blade to cut out a tissue sample. The blade is pushed down on your gum and doctor pulls on the center of the area to withdraw a circular sample. The sample is freed from the tissue with small scissors or a scalpel. Dr Rajmohan may decide to use a punch biopsy depending on the location of the abnormal tissue and how easy it is to reach. Brush Biopsy A brush biopsy is a noninvasive procedure used to gather tissue by forcefully rubbing a brush against the abnormal area of your gum. It is used for an initial evaluation, or testing. A brush biopsy is often doctor’s first step if your symptoms do not call for an immediate open or needle biopsy. If the results from this test show any suspicious growth or cancer, doctor will likely do an incisional or percutaneous biopsy to confirm a diagnosis. Surgical extraction involves the removal of teeth that cannot be easily accessed because they have not fully erupted or they have broken under the gums. 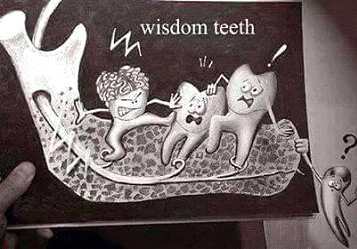 Wisdom teeth are the third and final set of molars found at the very back of the mouth. Most people get them during their late teens or early twenties. They are a valuable asset when they grow healthy and properly positioned but they may require removal when they get misaligned or impacted. When misaligned, wisdom teeth can grow inwards, sideways and at times position themselves horizontally. This eventually crowds and damages the adjacent teeth, the jaw and to some extent, the nerves. Those that grow leaning towards other molars may make these teeth vulnerable to decay by harboring food particles and dental plaque. Impacted teeth are those that remain partially or completely entrapped within the soft tissues or within the jawbones. IN THANJAI DENTAL CENTRE, We examine the positioning of your wisdom teeth. An x-ray can evaluate the alignment of your teeth. * We may even advise extractions even before they completely erupt. This can help avoid a more complicated and painful extraction in the future. *As a rule, wisdom teeth are removed at the earliest possible time, usually in the late teens, when the root of the teeth have not completely formed and the bones around the teeth are less dense. Wisdom tooth that only partially erupts through the gums leaves an opening for bacteria to enter and multiply and cause infections. Gum infection (Periodontitis) is an omnipresent lesion, which results in more teeth loss than any other dental condition. Recent research suggests that diabetes, cardiovascular diseases and few other systemic diseases/conditions like preterm low birth weight infants have a direct relation with the health of ones gums (Periodontium). Here every effort is taken to diagnose and treat gum infection at an early phase itself. Following Periodontal treatments are done here. 7. Gingivoplasty / Gingivectomy for managing enlarged gums. 8. Gingival Depigmentation for correcting heavily pigmented Gingival. *Autogenous bone grafts are the best materials, and are procured from the individual's own body, which helps to prevent rejection of transplanted materials. Auto genus bone is often taken from nearby sites such as the chin or jawbone, or from the hip. *Allografts are generally taken from bone of another individual, and most often cadavers. *Xenografts are bone transplants that are utilized from other species, such as pigs or cows. Since we are practising in multispeciality hospital,we have pioneered in oral and orthagnathic surgeries & in trauma management. Thanjavur is the prime locality for the surrounding villages, so we get the oppurtunity of treating more referral trauma cases.We have recorded history of more than 1000 successful cases of oral and maxillofacial surgeries(ORIF-open reduction ∫ernal fixation). We perform the proper treatment of facial injuries. We are well versed in emergency care, acute treatment and long term reconstruction and rehabilitation – not just for physical reasons but emotional as well. Dr.Rajmohan and his team are trained, skilled and uniquely qualified to manage and treat Facial Trauma. Injuries to the face, by their very nature, impart a high degree of emotional, as well as physical trauma to patients. The science and art of treating these injuries requires special training involving a “hands on” experience and an understanding of how the treatment provided will influence the patient’s long term function and appearance. Dr.Rajmohan meets and exceeds these modern standards. He is trained, skilled and uniquely qualified to manage and treat facial trauma. He delivers 24/7 emergency room coverage for facial injuries. There are a number of possible causes of facial trauma such as motor vehicle accidents, accidental falls, sports injuries, interpersonal violence and work related injuries. Types of facial injuries can range from injuries of teeth to extremely severe injuries of the skin and bones of the face. Typically, facial injuries are classified as either soft tissue injuries (skin and gums), bone injuries (fractures), or injuries to special regions (such as the eyes, facial nerves or the salivary glands). When soft tissue injuries such as lacerations occur on the face, they are repaired by suturing. In addition to the obvious concern of providing a repair that yields the best cosmetic result possible, care is taken to inspect for and treat injuries to structures such as facial nerves, salivary glands and salivary ducts (or outflow channels). Dr. Rajmohan is well-trained and is proficient at diagnosing and treating all types of facial lacerations. Certain other types of fractures of the jaw are best treated and stabilized by the surgical placement of small plates and screws. One of these options involves wiring the jaws together for certain fractures of the upper and/or lower jaw. Certain other types of fractures of the jaw are best treated and stabilized by the surgical placement of small plates and screws at the involved site. This technique of treatment can often allow for healing and obviates the necessity of having the jaws wired together. This technique is called "rigid fixation" of a fracture. The relatively recent development and use of rigid fixation has profoundly improved the recovery period for many patients, allowing them to return to normal function more quickly. 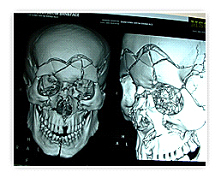 The treatment of facial fractures should be accomplished in a thorough and predictable manner. More importantly, the patient's facial appearance should be minimally affected. An attempt at accessing the facial bones through the fewest incisions necessary is always made. At the same time, the incisions that become necessary, are designed to be small and, whenever possible, are placed so that the resultant scar is hidden. Isolated injuries to teeth are quite common and may require the expertise of various dental specialists. Dental surgeons usually are involved in treating fractures in the supporting bone or in replanting teeth that have been displaced or knocked out. These types of injuries are treated by one of a number of forms of splinting (stabilizing by wiring or bonding teeth together). If a tooth is knocked out, it should be placed in salt water or milk. The sooner the tooth is re-inserted into the dental socket, the better chance it will survive. Therefore, the patient should see the dentist as soon as possible. Never attempt to wipe the tooth off, since remnants of the ligament that hold the tooth in the jaw are attached and are vital to the success of replanting the tooth. Other treatments like root canal therapy, restorations to repair or rebuild fractured teeth are also performed. In the event that injured teeth cannot be saved or repaired, dental implants are often now utilized as replacements for missing teeth. Diagnosis and surgical treatment of various facial deformities like protruded teeth, excessive exposure of gums, protruded lower jaw, retruded jaw or chin, asymmetry of face etc. Centre for Facial Deformity Correction - One of the best centres in the region for correction of Facial Deformities. Treatment for children with developing dentofacial deformities by various interceptive methods. One of the few centres in thanjavur for head & neck surgery with expertise in oncology,radiology and Maxillofacial surgery. we provide a full spectrum of surgical services and compassionate support for you and your family. Our team of dental experts offers special focus on Oral and Maxillofacial Surgery, giving out the highest calibre of surgical care for patients requiring bone grafts, implant placements and treatments for diseases and injuries to the teeth, jaws, mouth, bones and facial structures. Corrective jaw, or orthognathic, surgery is performed by Oral and Maxillofacial Surgeons to correct a wide range of minor and major skeletal and dental irregularities, including the misalignment of jaws and teeth, which, in turn, can improve chewing, speaking and breathing. While the patient's appearance may be dramatically enhanced as a result of their surgery, orthognathic surgery is performed to correct functional problems. People who can benefit from orthognathic surgery include those with an improper bite or people whose jaws are positioned incorrectly. In most cases, the upper and lower jaws have grown at different rates, and are not properly aligned. Sometimes jaw fractures or birth defects can affect jaw alignment. difficulty in chewing, biting or swallowing. breathing problems such as sleep apnea. Most patients are referred to our practice by their orthodontist when they believe the results of treatment will be superior if braces are offered in conjunction with orthognathic surgery to correct occlusion or jaw alignment problems. However, we often see patients who present without having consulted with an orthodontist. If orthognathic surgery is considered, then these patients are referred to an orthodontist in their area. Orthognathic surgery is now rarely done without braces. At your initial consultation, we will summarize the goals of surgery, the recommended procedure(s), the potential risks, benefits and alternatives to orthognathic surgery. Your surgeon will send a summary of his evaluation and treatment recommendations to your referring orthodontist. During this process, feel free to ask any questions that you have regarding the treatment. It is with a thorough understanding of this process that you will maximize its benefits. Pre-surgical orthodontics: the orthodontist will straighten the teeth, often without regard to how the upper and lower teeth fit together. Wisdom teeth often need to be removed at that time. Braces are usually worn for 12 to 24 months. The orthodontist will then inform you and the surgeon that you are ready to proceed with surgery. You will meet with your surgeon again to review the procedure. The surgical planning is usually done one to two weeks prior to surgery. X-rays, pictures, impressions and measurements are obtained which will help the surgeon plan your surgery in detail. Orthognathic surgery: the maxilla and/or mandible will be surgically re-aligned. This is done in a hospital setting and may require a hospital stay of one or two nights followed by a recovery period at home of two to four weeks. Post-surgical orthodontics: this will usually start four to six weeks after surgery. The orthodontist will adjust your teeth for six to twelve months to optimize the occlusion (bite). As you can see, the time commitment for the treatment is significant, and can range between one to three years or even more, depending upon the complexity of the problem. Braces are kept on the teeth throughout the entire treatment and it is important to keep up on good oral hygiene both at home and through frequent professional cleanings. Your surgery will be performed in our hospital. An anesthesiologist will put you to sleep and the surgeon will perform the surgery. He will be assisted by another oral and maxillofacial surgeon or an assistant. When you awake, you will have elastics (rubber bands) between your upper and lower braces, assisting with keeping your jaws together in their new position. You won’t be able to open your mouth much for the first few days, so a liquid diet is recommended during this initial period. You will be able to speak and breathe fine, but it will feel awkward at first. Post-operative pain is typically well controlled with either liquid pain medication taken orally or intravenous medications. You will go home with liquid pain medication, liquid antibiotics, and sometimes a decongestant. Your elastics will hold your jaws together for two weeks, and then your surgeon will remove them. At this point, you will be able to start chewing soft foods which can be easily squished between the prongs of a fork. It takes six to eight weeks for the jaw bones to heal enough to withstand normal chewing, so it is important to refrain from eating normal foods for at least six weeks. We at Thanjai dental centre,provide the best and same latest treatment without any compromise as in first line cities but at a more cost effective manner.